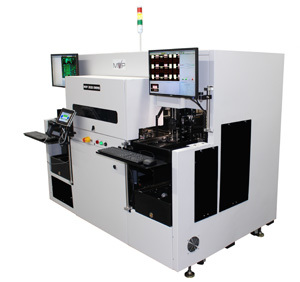 Machine Vision Products (MVP) today announced it would be demonstrating its Die Wire Metrology System (DWMS) and Semiconductor Automated Optical Inspection solutions at the Semicon West exhibition. CARLSBAD, Calif. - July 7, 2017 - PRLog -- Machine Vision Products (MVP) today announced it would be demonstrating its Die Wire Metrology System (DWMS) and Semiconductor Automated Optical Inspection solutions at the Semicon West exhibition. These latest capabilities are available on MVP's 2020 and 850G Platforms. Applications demonstrated will include die wire metrology, wire bond, wafer and surface inspection capabilities. The exhibition is at the Moscone Center in San Francisco from July 11-13, 2017. Machine Vision Products are exhibiting at booth #7724 in the West Hall (Level 1). MVP Microelectronics Automated Inspection platforms have been designed for high accuracy and high-speed inspection for multiple applications. With resolution and repeatability, a critical factor, the 850G and 2020 platforms can be configured to provide a resolution and inspection capabilities for all applications. Configurations are available to 1um. For handling, MVP Microelectronics AOI platforms can be configured for Lot Solutions including Magazine Handling, Lifters/Indexers, Jedec Trays, Waffle Packs, and Auer Boats. MVP's inline solutions allow for both single and dual lane processing, strip handling and in-line wafer handing. MVP can also provide custom handling solutions for specialized inspection applications. The MVP 2020 DWMS can be configured for cleanrooms up to Class 100. The 2020 includes MVP's integrated loader and unloaders and gripper based transport to and from the inspection bay. For Class 100 configuration Stainless Steel skins and Laminar Fan/Filter Units are provided as options. The 2020 DWMS is a modular solution providing options for additional ink marking, Lead Frame puncher and wire ripper capabilities within its review/defect handling stage. Dependent on Lead Frame density the 2020 DWMS is capable of producing UPH of better than 150,000. MVP's 850G inspection techniques include high-resolution telecentric imaging, quad color lighting, and 3D techniques to provide the maximum defect, and measurement capabilities for Die and Wire Bond inspection. In-line operations, single and dual lane options are also available to quickly process microelectronic assemblies. MVP also provide many material handling configurations for the 850G AOI system including magazine lifters, tray handling and other custom solutions. For in-line operations, single and dual lane options are also available to quickly process microelectronic assemblies. MVP is also a provider of software solutions that extend the power of our AOI technologies to provide advanced traceability and reporting options for our customers. MVP will be demonstrating its AutoNetworker, a centralized database with the flexibility to be configured for a host of data mining options. For all manufacturing environments, both measurement and pass/fail attribute data can be stored for every product, from every lot or work order and scalable dependent on the customer's requirements. Data can be retained based on a customer's own requirements from short term to endless data collection. Uniquely AutoNetworker's image archiving capability provides the ability to save every defect image detected by multiple AOI machines. For critical processes where quality is essential, the ability to provide visual traceability as well as data traceability is essential. MVP's AutoNetworker delivers this capability. AutoNetworker is a valuable tool designed with the ability to quickly create reports for quality managers, operation managers and process engineers via a web-based interface accessible from any intranet location. MVP continues to lead the global inspection arena by developing all of their product offerings. This provides a much better cost structure to the end user. Additionally, because all development is performed in-house, the support structure is second to none. With over 20 years of leadership, MVP is taking multiple steps to continue to provide the overall lowest cost of ownership when compare to any competitor globally. For additional information contact us at www.visionpro.com or visit us at booth #7724 at Semicon West 2017 where we can discuss your application requirements. About Machine Vision Products, Inc.
Machine Vision Products is a market innovator and leader in imaging technologies for Surface Mount, Microelectronics and Packaging Technologies. Machine Vision Products provide solutions for both commercial and military applications. Machine Vision Products operate globally with direct operations in the US, China, Malaysia and the UK, with additional representation in countries throughout North America, Europe and Asia.